Anyone having cycling withdrawals since the Tour de France finished? 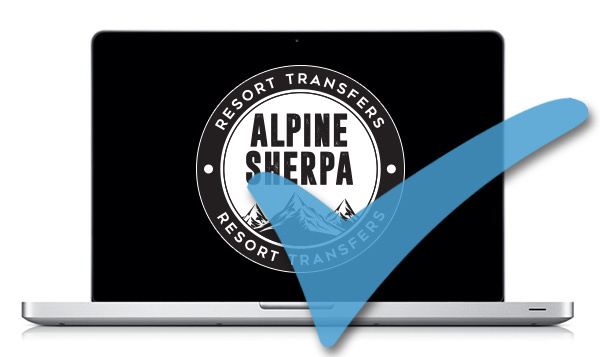 If so then fear not, the Tour de L’Avenir, a cycling race created and sustained by the Tour de France arrives in Tignes on Thursday 25th of August 2016. The Tour de l’Avenir was created in 1961 by Jacques Marchand, editor of the french sport newspaper L’Équipe. Since 2007, the competition has been entirely dedicated to young riders between 19 and 22 years old. The Tour is part of the UCI Europe Tour and the U23 Nations Cup. Therefore, it brings together international teams with riders aged less than 23. The race, similar to the Tour de France takes place over much of the same course but is for amateurs and semi-professionals known as ‘independents’. Until 1967, it took place earlier the same day as some of the stages of the Tour de France and shared the latter part of each stage’s route, but moved to September and a separate course from 1968 onwards. After 1992, the race was restricted to riders under the age of 25 and is now only for riders age 23 or younger. Many racers have started their career taking part in the Tour de L’Avenir and have gone on to win the Tour de France. 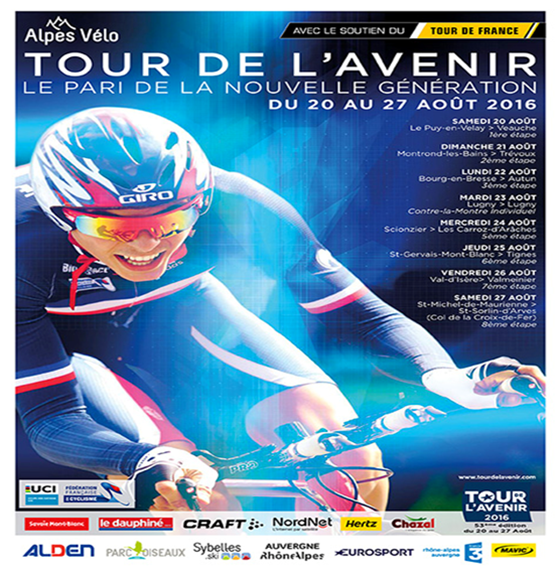 The Tour de l’Avenir is now considered the Tour de France for young riders. Since 1996, the competition draws its inspiration from the Tour de France with a one-week race in the same locations. Thus, it features stages on the flat, in the mountains, as well as a time-trial. The leaders’ distinct jerseys (yellow, green, white with red polka dots) are the same as on the Tour de France. Many winners of the Tour de France also appear on the list of winners of the Tour de l’Avenir. Among them: Felice Gimondi, Joop Zoetemelk, Greg LeMond, Miguel Indurain and Laurent Fignon who have all together won a total of 12 Tour de France. The race which lasts eight days started on the Saturday 20th of August in Le Puy en Velay and ends on the 27th of August at the Col de La Croix-de-Fer. 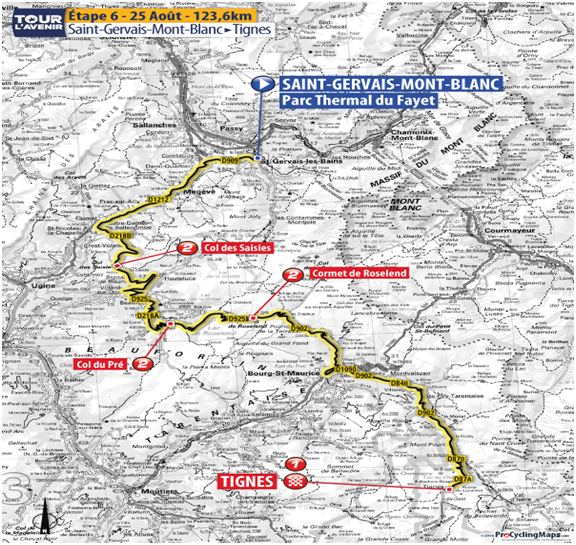 Stage six of the race takes place on the 25th of August, starting in Saint-Gervais-Mont-Blanc passing through the Cormet de Roselan, Bourg-Saint-Maurice and Villaroger before ending here in Tignes. If you’re in Tignes and fancy cheering the racers on head to the promenade de Toviere from 2.30pm where there will be cycling exhibitors and events with the arrival of stage six expected at 4.15pm. The traffic will be disrupted on August 25th approximately from 3pm to 5pm. On the way down: the road might close for 15 to 30 minutes. The Tovière promenade will be closed on August 25th from 6.30am to 7pm. No traffic in the Rosset area from noon on. The traffic will be disrupted at the entrance of Tignes le Lac when the peloton arrives (around 4pm).